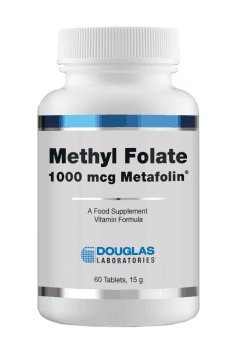 Douglas Labs Methyl Folate is a dietary supplement containing a physiologically active form of folate of 3rd generation - methyl folate (Metafolin®). Metafolin® is a safe and highly assimilable form of folic acid, which is a synthetic and inactive form. The recommended portion provides 1000 mcg of methyl folate. The product is appropriate for vegans and vegetarians. Metafolin® is a salt of the L-5-methyltetrahydrofolic acid (L-5-MTHF). This compound is an active “target” form of folates, produced from folic acid, directly taking part in the cycle of folate transformations. It constitutes the main form of reduced folates present in blood, contrary to the popular folic acid, which needs to undergo metabolic transformations to the active form before it achieves its activity in the organism. It is estimated that ca. 40% of the population has a genetic enzymatic defect, which causes disorder of the optimal production of the so-called active folate from folic acid. The occurrence of polymorphisms of MTHFR gene, coding the enzyme dihydrofolate reductase (DHFR), catalyzing the reaction of reduction of 5,10-Methylenetetrahydrofolate to active 5-methyltetrahydrofolate, is essential for bioavailability of folic acid. MTHFR gene mutation causes the disorders of the proper metabolism of folates and may lead to the unbeneficial cumulation of folic acid in the organism. Among the carriers of the mutated gene MTHFR, supplementation with folic acid will be therefore ineffective. Metafolin®, as an active form of folates is not subjected to the activity of DHFR and MTHFR, therefore its supplementation allows to skip the deficiency of this enzyme and the assumed process of biochemical transformations. Folates constitute donors of one-carbon residues, essential for the synthesis of nucleic acids and proteins, amino acid transformations or the creation of myelin sheath on nerve fibers. Therefore, they are especially needed in intensively dividing tissues, i.a. bone marrow or fetus tissues and they are essential for the proper development of all tissues of the organism. Folates condition the transformation of homocysteine to methionine. They constitute the source of methyl groups for the enzyme of methyltransferase, conditioning methylation of homocysteine, causing the drop of its level in blood. Deficiency of folates or metabolic disorders during supplementation with folic acid contribute to the development of hyperhomocysteinemia - a dangerous state, which can cause damage to the endothelium of blood vessels, thrombosis (stimulating coagulation processes), the development of atherosclerosis and other ailments of the cardiovascular system. Folates prevent the development of megaloblastic anemia. By taking part in the synthesis of DNA and proteins, folates with vitamin B12 are essential for the proper synthesis of the cell nucleus of blood-forming cells. As a result of considerable deficiency of folates and / or vitamin B12, the maturation and divisions of the cell nucleus are delayed, leading to the creation of pathological, enormous erythroblasts - macroblasts, which mature to big erythrocytes - macrocytes. Megaloblastic anemia gives symptoms of easier fatigue, weakness, pale skin, disorders of the digestive system or damage of the nervous system. Pregnant women and babies are in the risk group of developing this kind of anemia. Folates are an essential diet complementation of pregnant women and in the pre-conception period. Folates considerably decrease the risk of neural tube defects in the developing fetus. Deficiency of folates contributes to increasing the level of homocysteine, which negatively influences the implantation of embryos, increasing the risk of miscarriage and complications and moreover, it contributes to the development of disorders of the nervous system. To sum up, Douglas Labs Methyl Folate is a dietary supplement recommended especially to people who are the carriers of MTHFR gene mutation, pregnant women, demonstrating increased needs for folates and in the pre-conception period, as prophylaxis of anemia, in the state of fatigue, worse memory and cognitive functions and in order to decrease the level of homocysteine. Cellulose, dicalcium phosphate, croscarmellose sodium, vegetable stearate and silica. Complete formula that guarantees the efficacy of digestion. Stimulates digestion and prevents indigestion.